One of my favorite type of get-togethers is brunch. It is the perfect time of day, which allows you as the host to have enough time to prepare but yet early enough to get cleaned up and time to relax in the evening. Spending time with friends and family is so important and fun, especially as the weather begins to warm up. While I love cooking, cleaning up is NEVER fun! That’s why I love having premium Chinet® Classic White™ plates on hand. They are simple, elegant and strong. Using Chinet Classic White products makes serving and cleanup easy, so you can spend more time with friends, family and guests. Living in Portland composting is mandatory, it is nice to know that Chinet Classic White plates are made from 100% recycled material that can be composted after use. Even if you don’t live in an area with composting, they can be backyard composted! 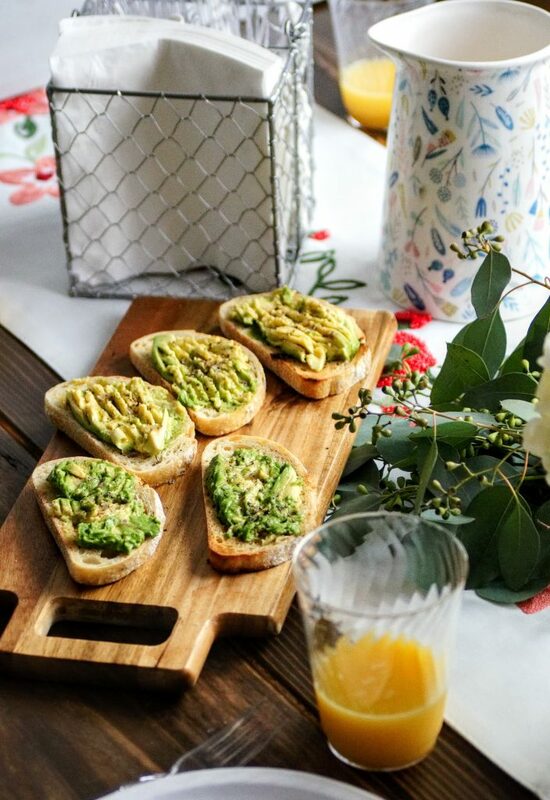 So here are some ideas to help you get your first brunch party underway! 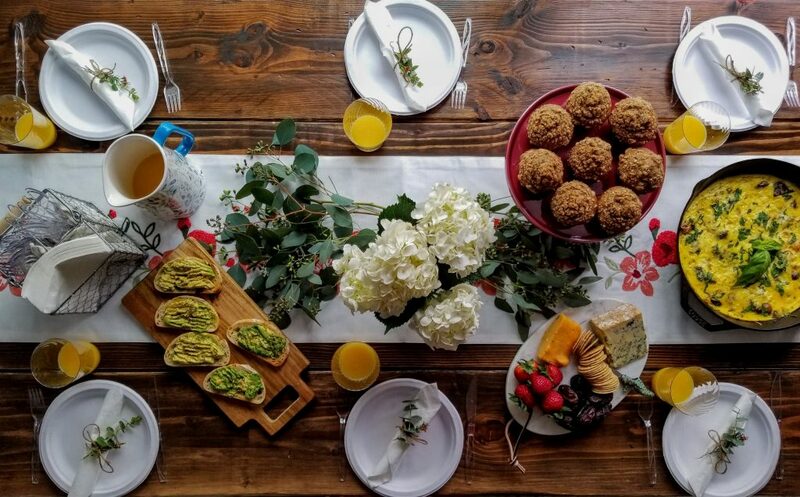 Full brunch table spread using Chinet® Classic White™ plates, napkins, cups and cutlery. First up is choosing a main course. 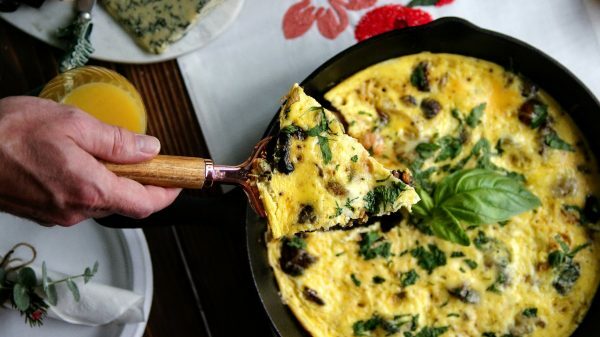 Something like this simple frittata (recipe below), a nice tray of mac & cheese, a bagel bar with homemade bagels + lox and veggies, or a putting together this savory tart are perfect options! Next, I always have a salad or some kind of veggies on the table or within the meal. For this brunch, I actually made up some avocado toasts drizzled with olive oil + flake salt and pepper. But a simple green salad or something like this carrot spinach salad would be lovely. A baked good is always appropriate, folks like to have something sweet, especially when it’s borderline breakfast. These banana muffins are perfect and individual portion sized. Or make a simple banana bread loaf, like this tahnini banana bread! Or really wow your guests with a gorgeous cake, here are some of my favorites: strawberry shortcake, apple cake, lemon blueberry bundt. Delicious banana muffins are perfect on a cake stand to elevate on your table for visual interest. A small cheese board with fruit, cheeses, olives and dips, such as hummus, labneh and baba ganoush are perfect for friends to snack on. 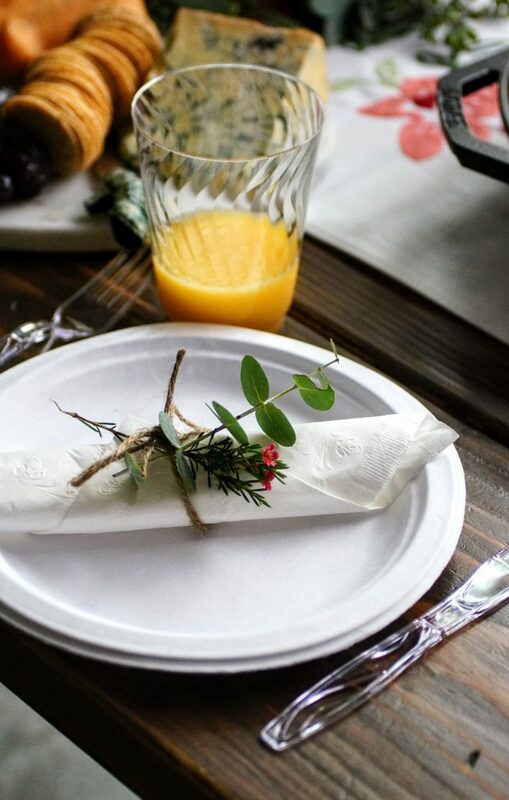 Setting the table for your guests is so important! I love adding some linens, such a tablecloth or runner to make it pop. Of course add some greens and flowers to make a gorgeous scene and an inviting place for your guests to dine. Then your tableware. I chose to use Chinet Classic White plates to keep my table simple, elegant and convenient for me. I also used Chinet Classic White napkins rolled and wrapped with some twine and greens to give them a bit of elegance and pop of color. Choosing to use Chinet Crystal Clear cut crystal cutlery and cups tied the whole table scene together and cleanup a breeze! Chinet® Classic White™ plates and napkins wrapped in twine and fresh greens. When you’re ready to begin your brunch, have your guests fill up their Chinet Classic White plates that are strong enough for extra helpings and enjoy a morning filled with fun and laughter without the stress of cleaning up! 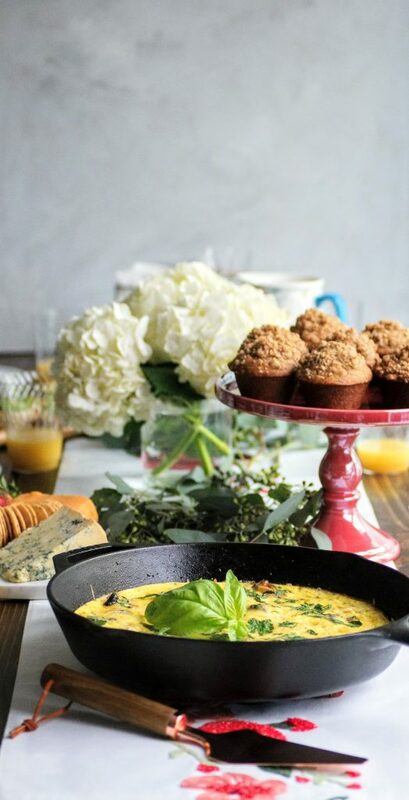 I hope you enjoyed the details on setting up a brunch and be sure to check out Chinet Classic White products by clicking here and the Frittata recipe below for your next event! In a small bowl, whisk your eggs, heavy cream, 1/2 tsp salt, a few grinds of pepper. Set aside. In an oven safe heavy-bottomed pan or cast iron skillet, heat your oil on medium-high and add in your veggies. Continue to saute until softened add your additional salt. Once veggies are softened, add in your pesto (or garlic), rosemary and spinach. Begin to stir and mix until spinach is wilted. Once spinach is wilted, flatten in pan and sprinkle cheese on top and allow to melt for 1-2 minutes. Pour your egg mixture on top making sure it coats the veggies in their entirety. Allow the eggs to set around the edges of the pan for 2-3 minutes. Then pop into 400 degree oven and bake for 8-10 minutes until eggs are set. You can cut a slit in the center, if any runny egg comes out, continue baking. Otherwise, remove and let cool for 5 minutes and then serve. You can adjust and adapt your recipe to include any leftover veggies, potato or meats you have on hand. It is a very adaptable recipe! Would love to see how you make it your own.